strong>March, 2018 – Inaugurated on 10th March last, in the east zone of the city of São Paulo, in a neighborhood with a very limited offer of training courses or other services and equipment of public interest, the Nova Unidade Senac São Miguel Paulista puts in place an architectural project by Levisky Arquitetos | Estratégia Urbana, strategically planned to strengthen the educational institute’s contemporary pedagogical proposal. 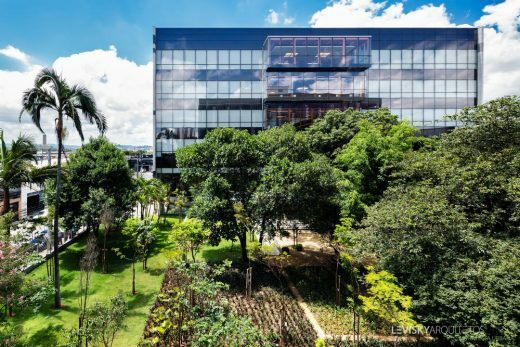 With 26 thousand square meters (26,000 m2) built on a plot of land of approximately eight thousand square meters (8,000 m2) and located on the corner of Marechal Tito and Rosária Avenues; it is the largest unit yet built for Senac São Paulo, offering long and short term courses in the areas of computing, personal beauty and wellness, health, gastronomy and hospitality and tourism, with 80% of vacancies earmarked for free placements. 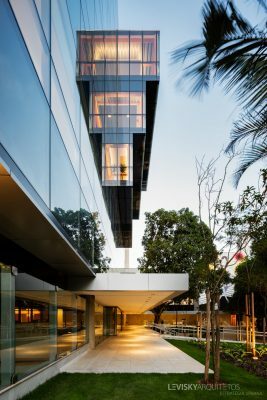 Project: Levisky Arquitetos | Estratégia Urbana. Photographer: Ana Mello. With the objective of stimulating creativity and multi-disciplinarity in the pedagogical process of infrastructure for educational vocation, the architecture conceived by Levisky Arquitetos | Estratégia Urbana expands teaching and learning options on the basis of the creation of internal and outdoor spaces designed to integrate with the traditional classroom. 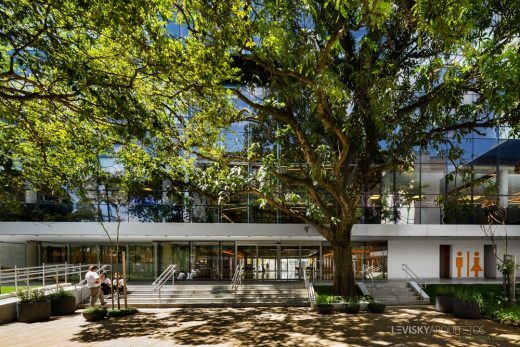 Working in synergy with the mission and values of Senac São Paulo, the architectural project affords students different opportunities and new educational stimuli. The architectural project for Nova Unidade Senac São Miguel Paulista puts in place solutions that value social interaction and integration, valorizing wide sidewalks and a square by the main entrance created to welcome the neighboring population as well as the students. A “lane” crossing the ground floor of the educational complex consisting of three interconnected blocks of buildings connects this main square to another internal one and the ground floor paving of the buildings at street level. “It’s a pathway for pedestrians designed to encourage local residents to make use of the space. Visitors are thus invited to enter the buildings, and they will immediately find the library right by the entrance on Marechal Tito Avenue and, a little further on, an auditorium with activities and events open to the public”, explains Adriana Levisky, the architect and town planner who is the owner-partner of Levisky Arquitetos | Estratégia Urbana. The plot of land, which has a good many trees, called for building spaces suitable for the coexistence of educational and leisure activities, social interaction, outdoor study and entertainment. “One of the guidelines was to preserve the pre-existing vegetation to the greatest extent possible. The mass of trees in the center of the plot of land led to a large internal square, onto which face a number of laboratories and classrooms, with transparent glass windows. While they carry out their activities, students will be able to enjoy green surroundings and natural light. People outside will be able to see what’s going on indoors, like a showcase of training courses and vice-versa. This is togetherness of public-private spaces”, explains Adriana Levisky. The conception, the building systems and the distribution of space were designed by Levisky Arquitetos | Estratégia Urbana to valorize flexibility of use of teaching equipment. 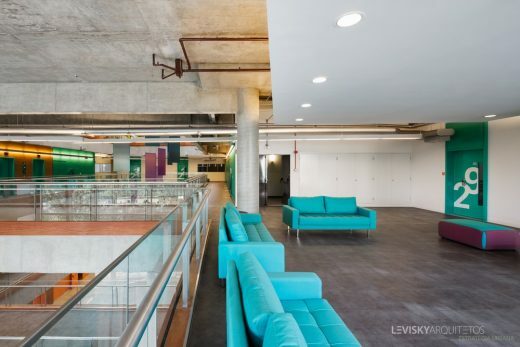 Thus, Nova Unidade Senac São Miguel Paulista boasts wide corridors which are transformed into an area of the elevator hall, consisting of didactic lounges where, for instance, it is possible to teach class in a less formal and more fluid manner. 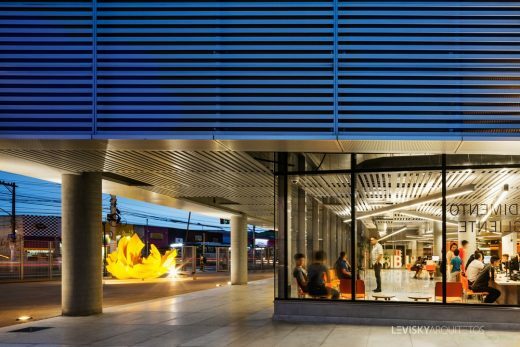 Visual communication and lighting technology play a vital role in the atmosphere of spaces. 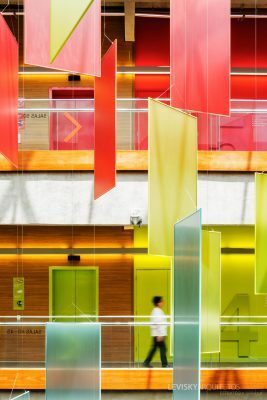 Integrated with the architecture, the language of color and pictograms, as well as luminous routes, help users find their way and make use of spaces. Paving is thematic, and every kind of course has its own specific color: red for gastronomy, yellow for computing, and their respective furniture follow the same pattern in ludic and sensorial form. In addition, simulation of real environments provides students of technical courses with contact with professional practice. The gastronomy course, for instance, has a confectionary and an industrial kitchen. Hospitality and tourism students will find the whole structure of a real bar in which to prepare cocktails, as well as a room that perfectly recreates a suite ready to welcome guests. One of the challenges facing the volumetric composition of the three blocks of buildings comprising Nova Unidade Senac São Miguel Paulista was to lessen noise from Marechal Tito, given that the main block faces this avenue. 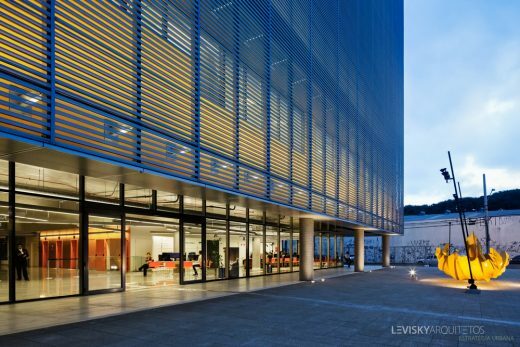 “For the main facade we specified frames with fixed window panes with acoustic protection”, explains Levisky. 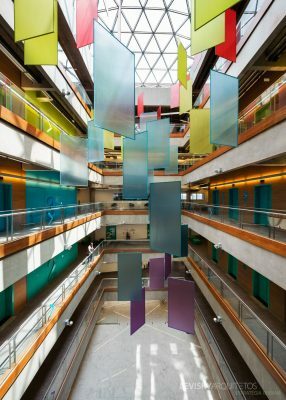 “And, as it is a large block, we projected a central atrium covered by a laminated glass cupola that adequately filters the sun’s rays while illuminating the interior of the building”, she says. 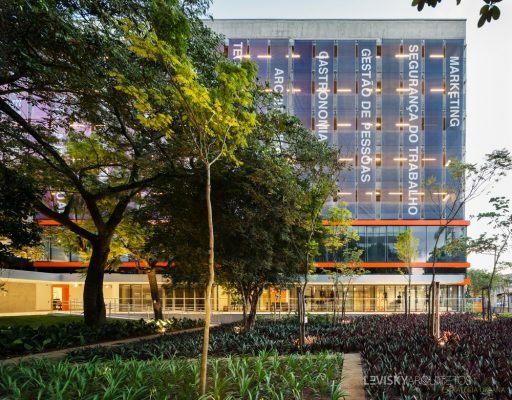 In strategic and integrated form, the volumetric composition of the three blocks projected is directly related to educational activities to be offered by the new unit of Senac São Paulo. The main block, which is the highest, was designed for most training courses. The central block, with two floors, includes a ground-floor auditorium for 200 people, with access from the internal square. It was projected for courses in the fields of publishing, radio and television, on the first floor. The internal square of this central block ensures intercommunication between all the blocks in the built-up ensemble. The third block houses the administration, as well as courses on landscaping, visagism and fashion, in addition to parking levels. The main block also boasts a system of ventilated facade, consisting of a large mosaic with cement aggregate plates and recycled material, with double glazed windows and micro-shades incorporated into the frames. 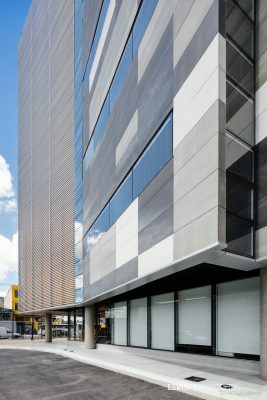 Metal brise-soleils on the north and west sides protect the facades exposed to intense sunshine and bestow the building with a contemporary look. The south face, which is protected from direct sun rays, has a completely glass facade, which looks over the square, creating an atmosphere both intimate and well illuminated, suitable for study. 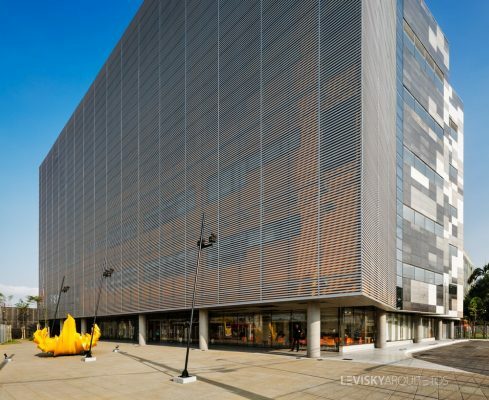 “Regarding the block with floors for parking, the facade is wrapped in ventilating fabric, attached to a complementary metal structure and serigraphed with information that can be constantly changed and updated in a fun-dialog with the passing population,” concludes the owner of Levisky Arquitetos | Estratégia Urbana. 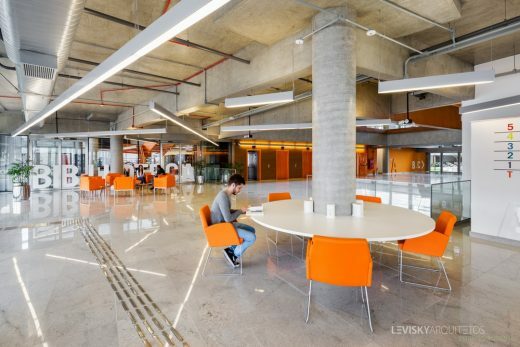 Levisky Arquitetos | Estratégia Urbana is an office that develop Architectural Projects, Urban Projects and Strategic Consultancy. On the basis of a vision bringing together creativity and innovation, it formulates specific solutions and actions related to strategic structuring based on urban and building rules and regulations, developing and obtaining approval of complex undertakings, as well as setting up neighborhood agreements and making public-private cooperation dialogue and models feasible. The ensemble of realized works by Levisky Arquitetos | Estratégia Urbana make up the portfolio of projects put in place that portray action focusing on requalification of public and private spaces for urban valorization, at all times bearing in mind environmental, social, cultural, technological and economic issues, especially in connection with infrastructure to improve quality of life in metropolitan regions. The Senior Partner of the office, Adriana Levisky is an architect and town planner, and vice-president of the Brazilian Association of Architecture Studios (AsBEA); a representative of the AsBEA in the Commission for Building and Use of Land (CEUSO), a councilor at the São Paulo Municipal Council for Urban Policy (CMPU) and at the Brazilian Sustainable Construction Council (CBCS).